Free for EducatorsThe path toward the goal of a world where people treat each other with respect and dignity is through effective education. Many human rights organizations focus on research and advocacy for the victims of abuse. Youth for Human Rights International complements this work by addressing those issues with educational materials and activities. Therefore our YHRI Education Package is provided to educators free of charge. The Story of Human Rights is a powerful and compelling documentary film that defines human rights by telling the dramatic story of their history and development from earliest times to the present day. It is suitable for all ages and can be shown in 9 languages. 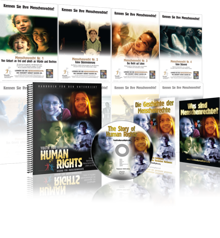 The Story of Human Rights booklets portray the illustrated history of the development of human rights from ancient times to the present day. An excellent tool for conveying the importance of human rights to young people, leading up to the creation of the United Nations Universal Declaration of Human Rights. It is available in packages of 24.